Hey remember when people use to go to coffee shops to hang out and chat? I know you do, the TV show Friends was based entirely on this premise. Apparently I missed the memo when this all changed. I was in the US with my father in law about a year ago and looking for somewhere to kill an hour or two before his flight. We stopped into an old favorite coffee shop of mine and promptly found glaring eyes from the freelancers who had made the establishment their office for the day when we opened our mouths to converse. Perhaps this is why coffee shops have become so ubiquitous. With more people working remotely, the need for alternative work places is high. In Singapore, the everywhere-ness of coffee is no different with these “third spaces” used for everything from alternative offices to short meeting spaces. And like most things in Singapore, you also get the east vs west mix. Options for your coffee range from 8 SGD venti Starbuck drinks to the more traditional $1.50 kopi from your favorite stall. I’m not sure how many kopi stalls and shops there are in Singapore but in case you were wondering how many Starbucks there are in Singapore, the answer is 100. Give or take any that have open/shut in the past month or two. How do I know this? 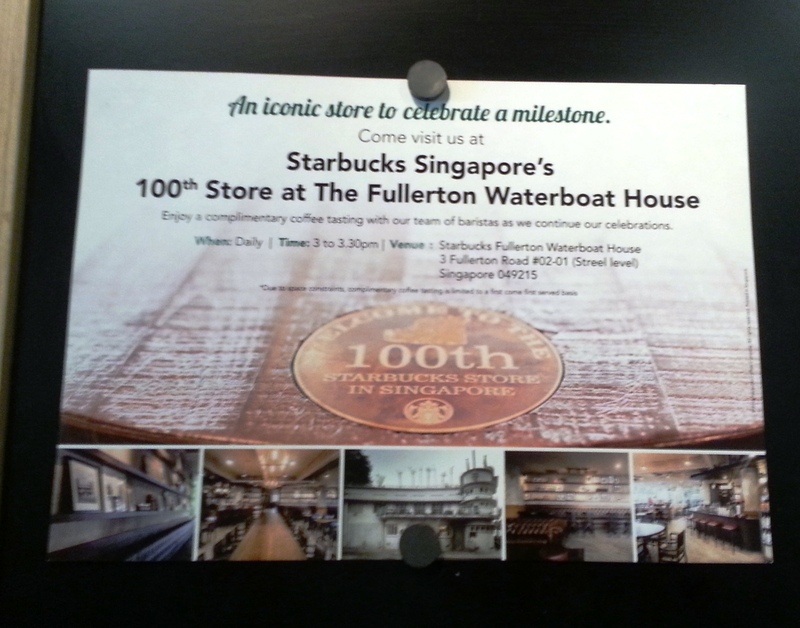 Well I stopped in one the other day and saw this sign advertising daily celebrations at their 100th location at Fullerton Water Boat House. Although I know how ubiquitous Starbucks is, I still found it a shock to have so many on an island that runs about 25km (15 mi) running north-south and 48.2km (30 mi) running east-west, or 716 sq km (that’s 276 sq mi). And while this isn’t more Starbucks than the company’s hometown of Seattle (142) or the most Starbuck ridden city Seoul (284), Singapore is still a country with a Starbucks every 7.1 km (2.7 sq mi). Seems a bit excessive, but then again, if the market can bare it, who am I to speculate? 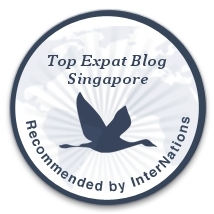 Add in dots for Uncle Kopi, independent coffee shops and the rest, and you’ve got one highly caffeinated city-state.